Add this to your list of conspiracy theories: Sir Walter Raleigh, Christopher Marlowe, George Chapman and Thomas Harriot,17th century luminaries of literature and science, met secretively in order to discuss their shared philosophy of atheism, a topic impossible to speak of openly in Elizabethan era England. And they call themselves the "School of Night." Did this group exist, did they all know each other, much less meet on a regular basis? No one knows for sure. There is no hard evidence for any of it but, like the Shakespeare authorship question, makes for interesting speculation. Proponents of the theory believe there are hints written into the works of Shakespeare, barbed references to what would have been a subversive movement. The smoking gun is in Love's Labour's Lost, Act IV, Scene III, "Black is the badge of hell / The hue of dungeons and the school of night." Not being an Elizabethan scholar, that seems like as weak as evidence gets. 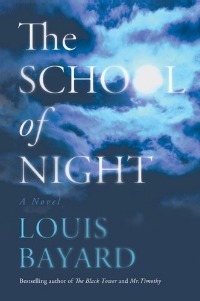 Louis Bayard's The School of Night uses this Elizabethan mystery as the backdrop for his latest book, intertwining a modern day story of two book collectors eager to lay hands on proof the group existed with the 17th century story of scientist Thomas Harriot, a neglected scientist given no credit for having been way ahead of his time. In the modern storyline a failed Elizabethan scholar, Henry Cavendish, friend of wealthy book collector Alonzo Wax, team up – along with a woman of indeterminate motivation, Clarissa Dale – in a game of cat and mouse with another collector, Bernard Styles, and his Scandinavian tough man, Halldor. Their goal? To decipher a mysterious letter that seems to point toward a hidden cache of Elizabethan treasure, uniting the half of the letter they know exists with the other, which promises to reveal all. And, wherever they travel, people have the inconvenient habit of dying. Meanwhile, in the 17th century Thomas Harriot works in his laboratory, doing what it is scientists do. And devising a method to hide a vast fortune? Well, we don't know that yet, now, do we. 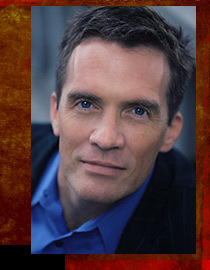 Bayard, unlike many historical novelists, uses a generous sprinkling of humor in his prose. When I first encountered it I was startled, expecting a much more serious tone based on the cover blurb. I wasn't sure I liked it, feeling alienated as Bayard's tongue-in-cheek humor kept pulling me out of the story. I can't say at what point that changed, but I'm glad it did. Once the characters were well-established the humor fit each quite well, and I came to not only appreciate but also anticipate it. This was a book I enjoyed picking up after having left off, though not one I was impatient about resuming. In the interest of full disclosure, historical fiction really isn't my main reading interest. The uncertainty as to what's real and what's fiction bothers me too much to know how to process these novels. Normally, suspending disbelief is not a problem, but in this case it is. The School of Night held my interest and kept me reading. After the initial problem assimilating the humor, I got into the story with much better attention. I grew to like the characters, though the plot remained a stumbling block 'til the end. Speaking of the end… Ack. I realize it's hard tying up loose ends, clipping off the excess, making a tidy package of not just one but two complex plots. But. How do I put this. It's the author's job. In this case, one not done particularly well. Too much unnecessary information, too over the top. After having grown to enjoy the book, along comes an incredibly disappointing, even ridiculous ending. Question: Where was the editor? Ack. Would I recommend the book? Obviously, my feelings are mixed. On the one hand, if you love historical fiction, especially the 17th century, there's some of that here. Perhaps not as much as the reader would like, considering the plot pops backward and forward in time repeatedly. Characterization was strong, as was the quality of the prose. The plot… Well, it was there, but the strong characters easily dominated. Definitely not my strongest recommendation. In fact, I can't guarantee devotees of literary fiction could make it through to the end. Nor, once there, that they don't feel like chasing me down with torches in order to inflict harm on my person for not outright declaring it a wretched read. Well, it's not wretched, but let's just say if I had it to read over again… I wouldn't. Previous Post When reviewers rebel.